Bernardino Realino was born on December 1st, 1530 in Carpi in the province of Emilia in Northern Italy.Bernardino Realino’s long life – he was over eighty-six at the time of his passing – can be conveniently divided into two unequal parts. His mother was mainly responsible for his early training in piety and profane knowledge. She chose the tutors who for sixteen years taught Bernardino at home, as was the custom with rich families in those days. His father was often away from home, as his services were in constant demand by several ruling princes, who inisisted on his attendance on them. When he was sixteen, he left the paternal home in order to complete his literary studies and for further studies in medicine. While he was at Bologna, another woman began to play an important part in his life, a beautiful girl, Signorina Calindra, who became eventually his betrothed. Apparently this young lady did not like men of the medical profession; and Bernardino, anxious to please his lady-love switched over to the study of law. He took his degree in civil and canon law in 1561. He was doing well. However the sunshine soon went out of his life, for about that time his long courtship with Calindra suddenly came to an end with the premature death of his beloved. In those days, Bernardino was a practising Catholic, but by no means an exemplary one. He was hot-tempered, and when he considered himself offended, he was liable to go to extremes. He also foolishly thought that when insulted, the proper thing for him to do was to challenge the offender to fight it out with deadly weapons. It would seem that one day he saw in the streets of Naples two young religious who impressed him by their modest exterior. He enquired who they were, and was told that they were members of a new Order, founded by Ignatius of Loyola and called the Society of Jesus. Bernardino, who had never heard of the Society of Jesus, wanted to know more about it. On the following Sunday he went to hear Mass in the Jesuit church, and also listened to the sermon. This sermon and the grace of God were the first seeds of Bernardino’s spiritual awakening. He sought an interview with the preacher, discussed matters with him, spent a few days in recollection and prayer, and made up his mind to enter the Society, not without some hesitation, because he was anxious about his old father. The poor man would get a great shock, he might even have a stroke and die suddenly. On the request of the General, Father Everard Mercurian, Fr. Bernardino was required in Lecce, Rome. In Lecce, Fr. Bernardino’s name became a household word. He endeared himself to all, young and old, rich and poor alike. He preached to the grown-ups, he taught the catechism to the little ones, he heard confessions for hours on end, he visited the sick in their houses and in the hospitals, he took a special interest in the prisoners and the slaves. He became the spiritual guide of priests, religious men and women including lay people. 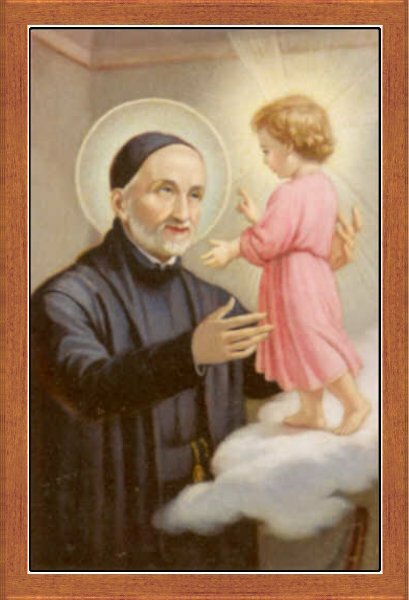 His saintly life deeply impressed the inhabitants of Lecce, and soon all sorts of rumours began to spread.The poor, whom he cherished above all others, began to spread marvellous stories. The Lord permitted him to work wonders and miracles. As years went by, the Jesuit college at Lecce saw many changes of personnel. Rectors came and Rectors went, but Fr. Bernardino remained. Of course, the inhabitants knew that sooner or later Fr. Bernardino would die. On July 2nd, 1616, Father Bernardino was heard to whisper Oh Santisima Signora Mia, “O Most Holy Lady Mine”. With Mary’s name on his lips, he breathed his last. He was beatified by Pope Leo XII in 1895 and canonzied on June 23rd, 1947, by Pope Pius XII. Saint Bernardino is thepatron of Lecce-Italy and we celebrate his feast on July 2nd.